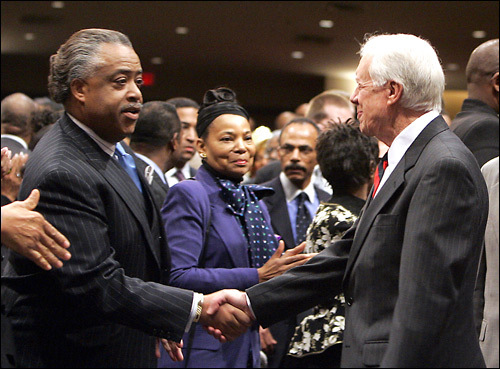 Sharpton: A Leader with Followers -- and Critics Asked if he is a national leader, Rev. Al Sharpton said, "I think that a leader is anyone with a following." And citing his political and organizational followers, he added, "In that context, I guess I am." Morning Edition samples the debate over African-American leadership. Rev. 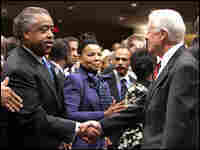 Al Sharpton shook hands with former President Jimmy Carter at a memorial service for Coretta Scott King in February.